288 people in our community are currently praying with you. Lord of Eternity, another home run by Fernando Ortega. Lift me to Your side. Look on my fainting soul. Touch me and make me whole. If You are my strength. Is to live in Your house all my days. I pray to you, dearest Jesus, for all the graces I need to know you, to love you and serve you faithfully unto death, and to save my soul. Give me a tender and fervent devotion to your sacred passion by which I was redeemed, venerating you each day in prayer, and teach me how to unite sorrows and sufferings of my life with your own. [Elijah said to Elisha] “As the Lord lives, and as your soul lives, I will not leave you!” So the two of them went on. And fifty men of the sons of the prophets went and stood facing them at a distance, while the two of them stood by the Jordan. Now Elijah took his mantle, rolled it up, and struck the water; and it was divided this way and that, so that the two of them crossed over on dry ground. 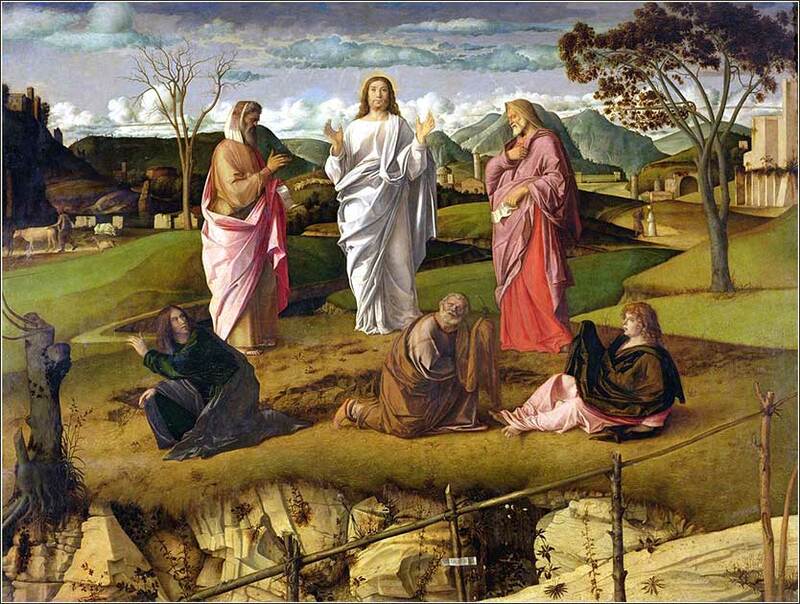 The Transfiguration of Christ is an odd moment and one we pay little attention to, generally, compared to the other great moments in Christ's life. But it was apparently important to God and to the evangelists, for it appears in all three Synoptic Gospels. We see Christ transformed at six points: 1) At his birth, the Word is transformed into flesh; 2) His baptism, when the Spirit descends upon him; 3) the Transfiguration; 4) Death; 5) Resurrection; and 6) Ascension. On four of these occasions, the transformation is outward, permanent and visible. But his baptism and transfiguration seem to be moments where we understand something might be going on that we cannot fully comprehend. 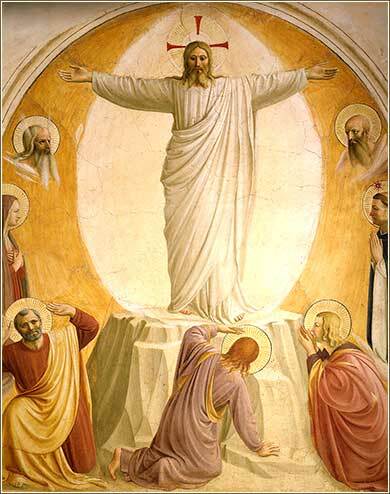 The first thing to notice about the Transfiguration is when it occurs: Immediately after Peter first recognizes the divinity of Christ and is told that He will have to suffer death, but will rise again. (Matthew 16:13-23) So, in one sense, Peter is the central figure, for the full glory of Christ as the Son of God is fully revealed to him. The presence of John and James is not explained and difficult to understand; but the very Judaistic nature of the event might lead us to think that they are witnesses, there to provide the second and third witness commonly needed to establish truth of an event under Jewish law (as Simeon and Anna witnessed Christ's divinity as an infant). The appearance of Moses and Elijah is easier to fathom: Moses embodies “the law”, and Elijah embodies “the prophets”. We cannot be sure if they are there in the flesh, or as a vision, but the second seems more likely, because Moses died and was buried. Simply put, they now “pass the torch” to Christ. There is a tendency on the part of Christians to envision Jesus as a complete person of God, omniscient and all-powerful, from the moment of his birth; but time and time again, this reductionist tendency, this simplification of the life of Jesus, is contradicted by the gospel accounts. Jesus' relationship with God the Father was complex. He prayed to the Father frequently, and spoke of him in terms of reverence. Christ was most surely not omniscient — He specifically tells us that He does not know everything the Father knows, e.g. Mark 13:32. On the other hand, He just as surely knew a great deal that common men did not. He was acutely aware of his future sacrifice and resurrection when He began his ministry. Something seems to have happened on the mountain here, just as something seems to have occurred at Jesus' baptism, having to do with Christ's state in relationship to the Father, but we cannot know it or fully understand it. But we can understand it in relationship to the fulfillment of the law and the prophets, for Christ here changes into the embodiment of that fulfillment, fully and completely. We might understand it as the moment when Christ officially changes from teacher into sacrifice. His role to impart knowledge ends, and his passion, his journey to the cross, begins. Which is why it occurs immediately after Peter first says, out loud, “You are the Christ”. It is the final lesson Christ's ministry was designed to teach. 1 John 2:9 (ESV): Whoever says he is in the light and hates his brother is still in darkness.